Garlic is just magnificent and phenomenal. I am providing few of the basics known and reliable home remedies for some specific ailments, which you could try at your home. We all face horrid acne, blemishes, blackheads during our teens. 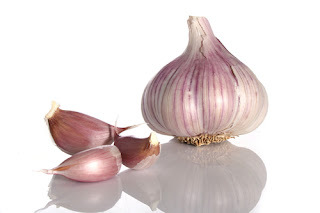 If you want to reduce it, or if you just want to glow up your skin, then take two cloves of raw garlic regularly with warm water early in the morning. It works as a blood cleanser and clean your system internally. Do not eat chocolates, spicy or oily food during this treatment and rinse your face five times a day with cold water. Drinks lots of water daily to flush off toxic waste from the blood and urinate whenever you feel that your bladder is full. Else, apply a cut clove gently on the affected area only if you have no sensitivity to it. If you have High Cholesterol Level, use garlic in your food. This is the better way for heart patients to reduce their cholesterol level. Modern medical science suggests one reason that garlic might reduce cholesterol , i.e. "Garlic is a proven anti-oxidant". This property might help to prevent LDL (Low Density Lipo Protein) from being oxidized. In this way the cholesterol build-up that clogs the arteries could perhaps be reduced by garlic. If you are very fat and want to loose weight, squeeze half lemon juice in one glass of luke warm water and drink it with two cloves of raw garlic regularly twice a day (morning and evening), for about three months. Avoid using starchy foods and fats. Do exercise regularly. You'll amazingly fell a great change in your body. If you have Wrinkles, and you want to use anti ageing cream, it would be better to use 3 cloves of garlic regularly as it has a powerful antioxidant effect, which help to protect the body against damaging "Free Radicals". Remember, out skin is made up of collagen and it looses elasticity on yearly basis. Therefore, use garlic and do exercise regularly for the positive results. Take garlic to boosts the weight of babies in the womb. Thus, when they are born, they are heavier than they would have been if you hadn't taken garlic. Some babies are born too small, so garlic is a definite boon in these cases too.